As a small child, Fathey Mychal Judge sometimes gave his only quarter to a beggar on the street. Having lost his own father when he was six, Judge shined shoes at Penn Station to help his family survive. He would visit St. Francis of Assisi Church just across the street. Seeing the friars there made him realize he “didn’t care for material things… (he) knew then that (he) wanted to be a friar.” Judge began the path towards ordination when he was just 14. In 1986, he was assigned to St. Francis and would stay with them until his death. 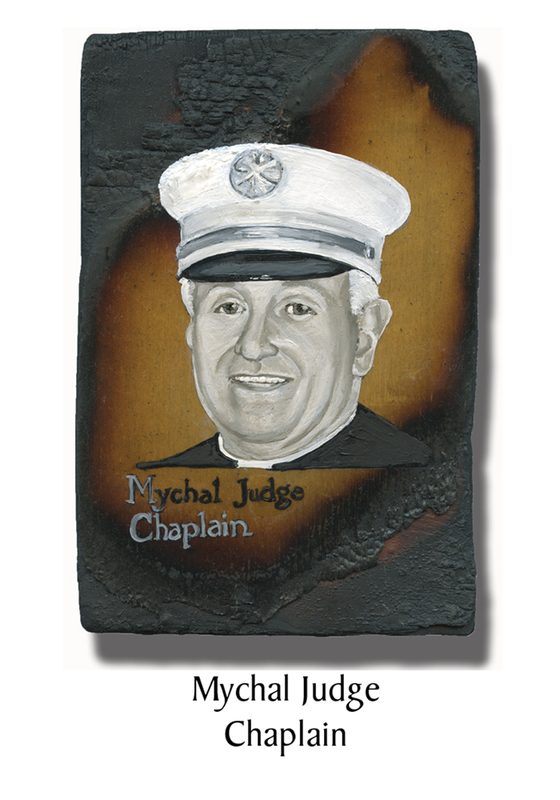 In 1992 he was made a chaplain of the FDNY. When the South Tower collapsed at 9:59, debris came flying through the North Tower lobby, killing many inside, including Judge, who was struck in the head. Judge had been praying non-stop since he arrived that morning, and performed last rites on those for whom he could. Shortly after his death, an NYPD lieutenant found Judge’s body. Assisted by two firemen, an FDNY EMT and a civilian, they carried Judge’s body out of the North Tower on a chair. A famous photograph of this is “considered an American Pietà.” His body was first laid on the altar of St. Peter’s Church before being taken to E1/L24 on West 31st where he ate all his meals. His was the first officially registered death of the day, Number 0001. After his death, Congress revised the rules so that a fire chaplain killed in the line of duty can receive the same Federal death benefits as firefighters. He was nominated for a Congressional Medal of Honor. His helmet was presented as a gift to the Pope. France awarded him the Legion d’Honneur. Nearly 3000 people attended his funeral. He was 68 years old. This entry was posted in Better Angels Stories and tagged 343, 9/11, better angels, Dawn Siebel, FDNY, firefighter, firefighters, firefighters of 9/11, LODD, Manhattan, memorial, Mychal Judge, NFFF, paintings, portraits, World Trade Center, WTC. Bookmark the permalink. It was fewer than 30 days after the ‘Terrorists Attacks of 2001′ and I was in Washington, D.C. with my friend, the late-Robert White. He was driving a shortcut through some unfamiliar streets near Georgetown (at least I ‘think’ it was Georgetown) as we were on a mission to do some historic research. Ahead was a stop sign. When the vehicle rolled to a halt, we both happened to glance at the wall of a corner building. There it was – huge in size an rendered in color. It was a freshly painted / mural-size artwork of ‘The American Pieta’ photograph. I might have gasped – I know Robert swiped an escaping tear; We were stunned. No traffic behind us so we remained transfixed for many minutes, simply looking… It was remarkable a fresh news event had produced an image that was instantly remembered. But much more important were the deeds that were the inspiration for this profound creation of art.